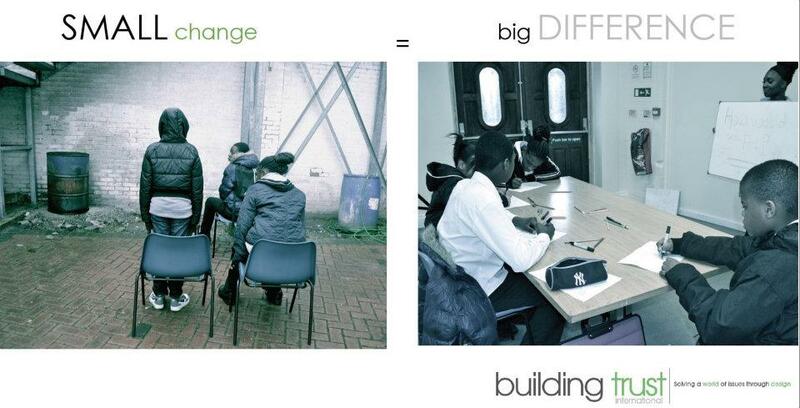 On the 17th February, Building Trust set a challenging brief to 180 Level 1 design students from Brunel University. The challenge was to design living quarters for migrant workers within the city of Singapore. The subject area of migrant worker housing called for students to address the fundamental design topics of form, space, context, materials, location, cost and multi functionality. Students were asked to look at the use of space on a number of scales from unit/dormitory size to individual living spaces. The students had to thoroughly research their end user looking into their beliefs, religion and background. The students also had to understand human scale and how the end user would interpret and use the final design. It was also very important that the students paid close attention to selection of low cost/sustainable materials and to the multi-functionality of spaces and products. 6 weeks after the brief was sent I went in to review the students work and crit alongside the key module leaders. The work was outstanding and it was very motivating to see how hard all the students had worked and how much they obviously enjoyed the brief set. Speaking with the students I learned how they had carefully spent weeks researching about the city of Singapore, it’s inhabitants, the climate and the culture of the migrant workers. It was great to see how dedicated the students were to coming up with some truly innovative and creative new designs for migrant worker housing. The students had spent a full day rig building, creating full scale structures out of materials they could find to make sure they fully understood the space they were designing and to gain a real feel of the space to be used by the migrant workers to sleep, eat and relax. Students also built small scale models to gain an understanding of the layout of the building. One team cleverly worked out a way to test the air flow through the housing model by lighting incense inside and seeing where the smoke travelled. 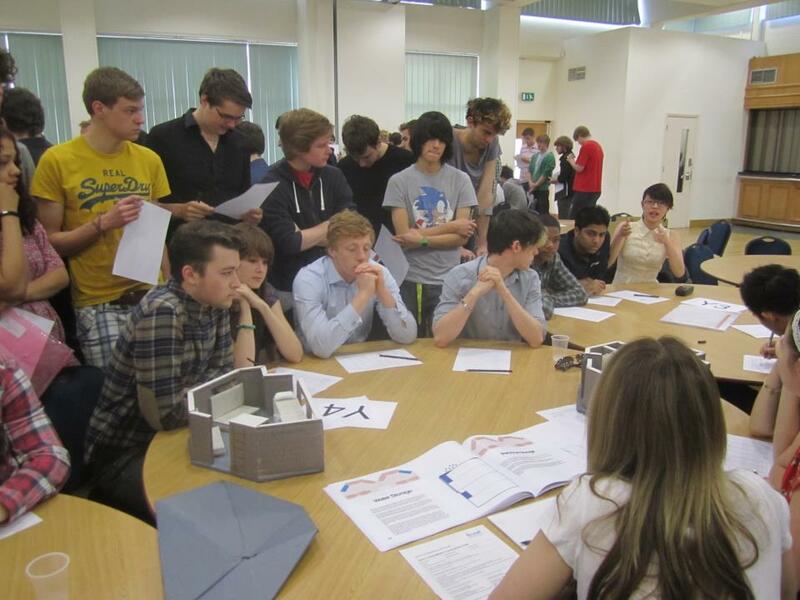 It was great to see teams thinking outside the box and I could tell they really enjoyed working on their projects. 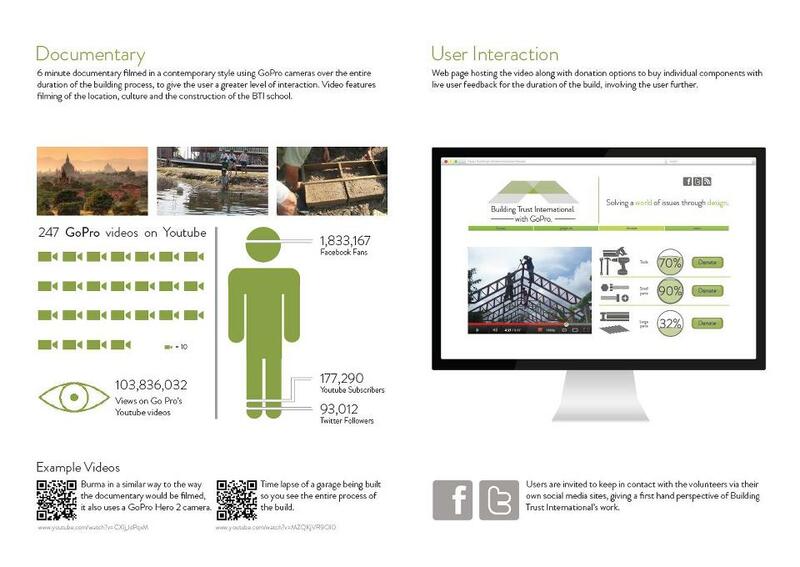 I look forward to sharing with you images of the project booklets which each team created (a 50 page A3 document with all details of their design process.) Many of the teams had a very clear visual layout and really understood how important visual communication and graphics are in conveying an idea to a client. I will also be posting images of their rig building day and a few of the incredible scale models. It was a great day and I was so proud of the students for their hard work and dedication to the project. Having graduated from Brunel in Industrial Design just a few years ago it was really rewarding to go back and work with the students on a project which I had developed with Building Trust. I look forward to continuing the collaboration with Brunel in the future and wish all the students good luck for finishing their project hand ins over the next few weeks. At Building Trust we believe it is very important to work with young design students to help motivate them to see how design can be used as a tool for social change and hope they will continue to think about social design through their entire course and beyond. In recent months we have had a huge interest from people wanting to volunteer for Building Trust to get involved with one of our projects or to fundraise for our work. We are generating a fantastic community of like minded individuals who share a belief that design can be used as a tool for positive social change. In order to get people talking we have decided to host a ‘Drinks and Ideas’ evening to let people know exactly how they can get involved with our projects. I would like to invite you to the Building Trust ‘Drinks and Ideas’ night. At the event we will be giving an update on current, new and future projects and will be discussing how you can get involved. 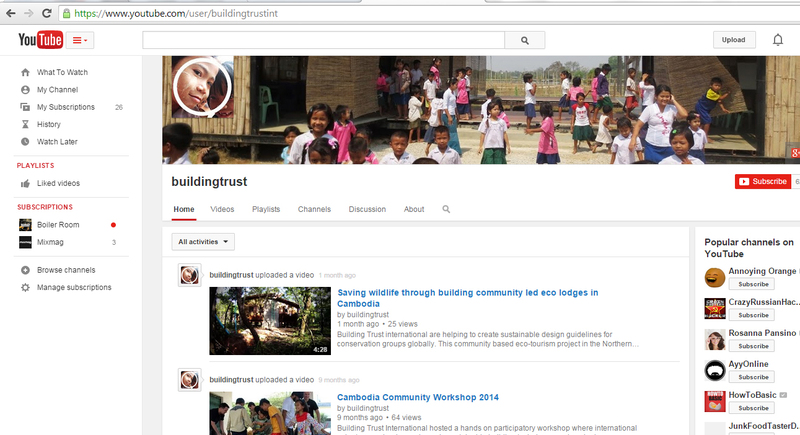 We will also be looking at the Mae Sot school build and how you can take part. This isn’t a closed event, we want as many people as possible to attend so bring your friends and pop in for a chat and be part of a growing community of people involved in our exciting projects. Well after finding out about the great donating platform JustTextGiving at the Vodafone WOD Induction Day, I decided to register Building Trust with a campaign number. After much deliberating to choose the right text and number we have gone with FUND41. And the results are paying off with donations coming into our JustTextGiving account – Very exciting!!! To donate, simply text the code FUND41 followed by the amount you want to donate (£1, £2, £3, £4, £5, or £10) to 70070 and we will receive your donation to our JustGiving account. What’s more, if you are a UK tax payer, we will also be able to claim Gift Aid! So please show your support and text donate TODAY! The ‘Moving Schools’ campaign which you will be supporting will provide modular, mobile sustainable school designs for Burmese migrant refugee children who need an opportunity to gain an education and a chance in life, you can help us help them! I am very happy to announce the winners of the Building Trust International Student Charity Campaign Project 2012 as Brunel Design students Jodienne Ball and Lucinda Bennin who came up with a fantastic video campaign entitled ‘What if it happened here?’ The campaign is set to raise funding for our ‘Moving Schools’ project and also raise public awareness for our charity. We hope you enjoy and share! Image above showing Sam Whyman and Rory Southworth’s proposal for their campaign idea linking Building Trust with the World’s most versatile camera GoPro. The team believe that by creating a 5min documentary of the school construction in Mae Sot and then posting it on the GoPro Youtube channel and making the video viral the video would create public awareness of the ‘Moving Schools’ project and hopefully raise further funding. The students contacted a member of the GoPro team and we are now hoping to discuss the possibility of gaining some GoPro cameras to film the build. – Image above showing Matthew Buckland, Andrew Binnie, Andrew Guscott, Sophie Kell and Michael Kilner proposal who came up with the idea of a poster campaign where individuals could enter a competition to create a campaign poster for Building Trust creating interest and attention to our projects. 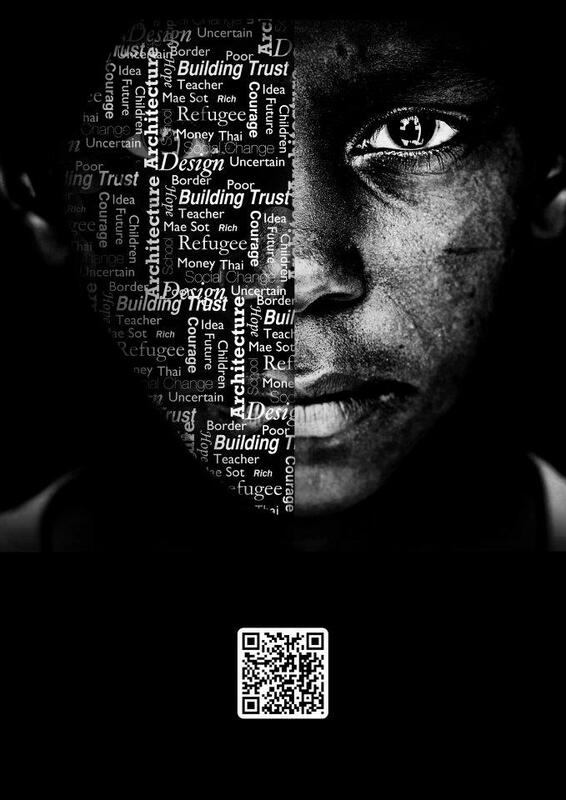 The posters would be placed on Tumblr and hopefully raise awareness of the Mae Sot build. – Image above showing Jesse Smith’s proposal, Jesse came up with the idea to raise funding for the Mae Sot build by placing the school project on a funding platform such as Kickstarter. Jesse also came up with a visual communication for online donations. As donations were received by the website a visual render of the school would be constructed on screen giving the user immediate feedback. So please keep reading the blog to see how we go forward with some of the ideas from the students campaign ideas. It was great to work the students and we were very pleased with the work they produced. We now look forward to returning to Brunel on 30th March to review a project set to the Level 1 students so keep reading! Many thanks to all the Brunel students who took part in the project and a huge thank you to the Course Leader, Farnaz Nickpour and Sarah Silve for all their time and dedication to the course module. 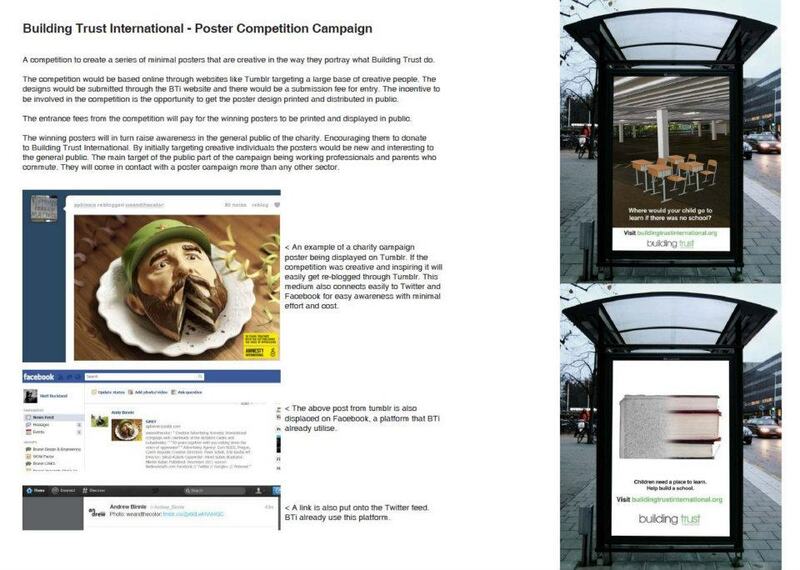 I was going to wait until I had all the Brunel students campaign ideas in before posting them. However, I have just received one of the ideas a video campaign by Jodienne and Lucinda from Brunel. The video sets out the story of a group of young adults in the UK getting ready for school in the morning. However, when they get to school the building is not there. The team wanted to try and make people think, what if children in the UK did not have a school building to be taught in? Where would they go to school? How would they gain an education? The team make a connection with the viewer and hope that they will then sympathisis with the Burmese migrant children who we hope to help this summer by building them a new school. So please watch and share and help us raise more funding for the school for Burmese migrant refugee children in Thailand this summer. Another great way of fundraising which is being discussed a lot online at the moment is Kickstarter which is the worlds largest funding platform for creative projects. Projects can be uploaded against a set time deadline and funding target goal. People then donate set amounts online and receive rewards from the project, for example $10 donation = A thank you on the projects Facebook wall. I was very interested in using Kickstarter to raise funds for our school build, however at present projects can only be uploaded by American citizens. However, on Friday I met up with a member of the Business Development team from the French online funding platform KissKissBankBank who are about to launch a UK website for their company. It was a very interesting meeting, learning about the new creative way to raise funding for many types of projects. The French website currently hosts projects looking for funding to develop documentaries on natural disasters, artists looking for assistance to create a new album and similar projects to ourselves providing assistance to communities in need such as building a library for a village in Togo. I am very excited about working together with KissKissBankBank to hopefully start a fund raising project for Building Trust on the new UK website later this month. So keep reading to find out more! I also met up last week with Caroline Lister, the Project Director for 1A Arts Etc a fantastic organisation offering a range of services for local children, young people and adults in the Holborn area. They have a fantastic volunteer program and are very successful at raising funds through their volunteers. I was kindly put in touch with Caroline through the Small Charities organisation who are very helpful at putting people in touch with fellow Third Sector workers who offer their time and assistance, sharing their knowledge of working for charities. It was great to meet with Caroline who let me pick her brain and ask numerous questions on how best to make a voluntary position a permanent job and new interesting ways on how best to gain funding for a charity. I have also set-up a JustTextGiving account for Building Trust which seems to be a great way to receive immediate donations from our supporters. To donate people can simply text the code FUND41 followed by the amount you want to donate (£1, £2, £3, £4, £5, or £10) to 70070 and we will receive your donation to our JustGiving account. What’s more, if you are a UK tax payer, we will also be able to claim Gift Aid! So please show your support and text donate TODAY! So last week was a very busy week and it was great to meet with such a wide range of individuals offering to help pass on their ideas and suggestions as to how to kick start a fundraising campaign for Building Trust.